The VAT is to me an obviously bad idea, especially as long as there is also an income tax. But why Senators Cruz and Paul would support one is way beyond me. In early 2013, a reader asked me the best place to go if America suffered a Greek-style economic collapse. I suggested Australia might be the best option, even if I would be too stubborn to take my own advice. Perhaps because of an irrational form of patriotism, I’m fairly certain that I will always live in the United States and I will be fighting to preserve (or restore) liberty until my last breath. But while I intend to stay in America, there is one thing that would make me very pessimistic about my country’s future. Simply stated, if politicians ever manage to impose a value-added tax on the United States, the statists will have won a giant victory and it will be much harder to restrain big government. Utah to raise taxes on the sick to pay for Medicaid expansion? Utah is one of the many states that has so far resisted expanding Medicaid under Obamacare. It’s a smart decision: While the Federal government (read, the entire nations through taxes or borrowing) pays for an initial 90% of that expansion, that percentage goes down over the years and leaves the state more and more on the hook. It’s a delayed budget-buster that would force a state to impose its own ruinous taxation; Medicaid already eats a huge portion of state budgets, and this would make the problem far worse. According to the few specifics made public, the biggest component of the negotiated framework is to levy a new “assessment” on medical providers in Utah to help pay for the state’s share of expansion. But the so-called assessment is simply a new Obamacare tax on the sick that will not only raise health care costs for all Utahns, but add significantly to the national debt. Gov. Herbert says this plan will allow the state to expand Medicaid under Obamacare without the need to “raise taxes” to pay for it. But the proposed provider tax is still a tax – and not just on providers. Hospitals and other providers won’t pay this tax. Although they may write a check and send it to the state treasury, they won’t bear the burden of a new tax. As Milton Friedman frequently explained: only people can pay taxes. This new Obamacare expansion tax will simply be passed along to Utahns seeking medical care. Worse yet, this new tax will be borne not just by sick Utahns, but by taxpayers everywhere. This new scheme was designed specifically to draw in more money from federal taxpayers. Here’s how it works: hospitals and other providers will pay an “assessment” to the Utah government. Utah will then turnaround and spend those dollars in order to trigger federal “matching” dollars for Medicaid expansion. In this case, federal taxpayers will have to kick in an extra $9 or more for every dollar Utah collects from the sick. And remember: there is no magic pot of Obamacare money to cover those funds. Any federal money Utah spends on Obamacare expansion will simply be added to the national debt. Proponents of the measure, including the Governor, are lying to the people of Utah. Call it an “assessment” or a “fee” or even “broiled fish,” a tax is still a tax. John Roberts notwithstanding. They are also lying when they say the tax will be borne by providers. Bullsh… Er… Nonsense. This cost will be passed on to those receiving services: the sick. 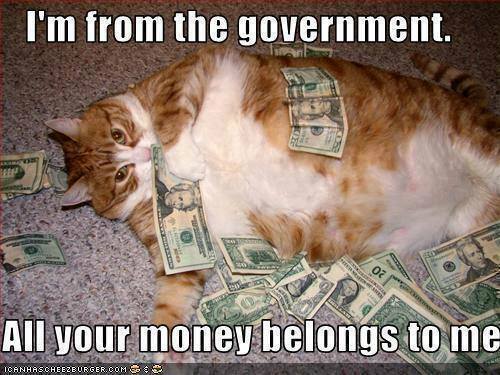 The federal government will have to borrow money or raise taxes to pay its share if this. Either way, that’s more from you and me. And, on top of it all, Medicaid expansion is still a looming fiscal disaster for the Beehive State. This stinks to High Heaven. The good people of Utah should contact their legislators and the governor’s office to remind them that a) they do not like even more of their hard-earned money being snatched from their pockets to pay for stupid ideas; and b) elections have consequences, especially for pols determined to do dumb things. Nearly two in three Americans who bought subsidized health insurance on the Obamacare exchanges this year had to pay some of the federal dollars back, according to new data from H&R Block. That’s because they presumably collected more federal aid than their income qualified them for. In that case, consumers must either pay some of it back or — in most cases — the IRS will subtract it from their tax refund. Policymakers have expressed concern that low-income people could struggle with paying back the subsidies — or suffer if their tax refunds are greatly reduced because of overpayments. The average amount consumers owed back to the government was $729, cutting their potential tax refunds by almost one-third, said the tax preparation company. The article also mentions that 25% of Obamacare subsidy receivers received larger refunds because their income was less than expected. Good for them. BUT… It’s the angry people who will remember this: they were forced to give up policies and medical providers they liked and that met their needs for more expensive policies and more restricted networks that didn’t meet the needs they had and met “needs” they didn’t have. (1) Then they were forced to pay even more, giving back some of the tax refund (2) they thought they were getting, maybe even had already spent. And this will happen again in 2016, an election year. Angry people have long memories. (1) Like maternity coverage for elderly couples. Really. (2) I know you have trouble with the concept, progressives, but the money belongs to the one who earned it. The government just takes it. And so a refund is just giving a person back his own money — without interest. The difference between a conservative and a progressive: the conservative believes the money you earn is yours, and the government should take only the minimum it needs to perform necessary tasks. The progressive believes the money is yours, but government knows best how it should be used and how much you really need. I’ve sometimes asserted, only half-jokingly, that statists believe all of our income belongs to the government and that we should be grateful if we’re allowed to keep any slice of what we earn. This is, at least in part, the mentality behind the “tax expenditure” concept, which creates a false equivalence between spending programs and provisions of the tax code that allow people to keep greater amounts of their own income. Here’s how I characterized this moral blindness when criticizing a Washington Post columnist back in 2013. #Obamacare chronicles: People refusing to pay the fine? And maybe that “good thing” has started? Taxpayers are already telling their accountants they plan to stiff the IRS on the Obamacare tax, saying they figure the chances the agency comes after them for a few hundred bucks are pretty slim, and it makes sense to take the risk. Still other taxpayers are recoiling when they find out they owe far more than the $95 minimum penalty for not having insurance in 2014, said Christopher Wittich, an accountant in Minnesota. Taxpayers are facing the first round of penalties under Obamacare’s “individual mandate,” which requires most Americans to prove they have health insurance coverage or else pay the tax that the Supreme Court ruled made the law constitutional. The episodes raise questions for the revenue agency, which is trying to figure out just how far it’s prepared to go to collect the Obamacare tax — and if future administrations will enforce it at all. As I pointed out in another post, these people just finding out their 2014 penalty Shared Responsibility Payment may already owe for 2015. Surprise! Also, I had forgotten that, as the article points out later on, the IRS is forbidden from laying criminal charges or liens against people who don’t pay the penalty. All they can do is lower their future refunds. You can bet there will be many people willing to pay that price, rather than shell out for the more expensive “affordable care” policies. Regardless, this refusal to pay strikes me as a good thing, a sign that our spirit isn’t dead yet. I hope it catches on, and that everyone refuses to pay. I wrote before about how the Democrats are increasingly frightened of the angry mob that might rise against them once the non-coverage penalties in Obamacare start to be enforced. People who didn’t obey the mandate in 2014 will likely find themselves with smaller refunds than expected, or maybe even owing Uncle Sam. That makes for unhappy voters, who will be looking for someone to hurt. Probably the congresscritters (All Democrats) who voted for Obamacare. There’s another problem. The administration’s enrollment period just ended on February 15. So if people haven’t signed up for Obamacare already, they’ll be stuck paying the higher penalty for 2015. By the way, Democrats don’t like to call the Obamacare penalty a penalty; its official name is the Shared Responsibility Payment. But the fact is, the lawmakers’ intent in levying the fines was to make it so painful for the average American to ignore Obamacare that he or she will ultimately knuckle under and do as instructed. And the penalties get even larger in 2016 for those recalcitrant serfs who still refuse to obey their Betters in DC. Estimates of those range from 3-6 million people. So Congressmen Doggett, Levin, and “Baghdad Jim” McDermott implored the administration to create a supplemental “open enrollment period” so people who didn’t buy by the 15th could do so and escape the 2015 “Shared Responsibility Payment.” And so the Democrats could escape the angry mob. This exemption comes with a stringent qualification standard, however: You have to be willing to say “I didn’t know,” and you will be magically cleansed of your sins. The administration has done this before, granting exemptions and delays ex machina for the employer mandate with no legal authority to do so. (The ACA is very clear about its deadlines.) Now it’s an extension for open enrollment. Let’s be frank: none of these illegal waivers were granted because of sympathy for the victims. Their sole purpose is to help Democrats avoid the consequences of ramming this anti-constitutional monstrosity of a law down the throat of a nation that didn’t want it. By delaying the mandates and punishments past election day or simply granting exemptions to the latest group to complain (Oh wait! Here’s another enrollment period! ), they hope to avoid the electoral whipping they so richly deserve. The individual mandate has always been extremely unpopular. In December 2014, just a couple of months ago, the Kaiser Family Foundation found that 64 percent of those surveyed don’t like the mandate. The level of disapproval has been pretty consistent since the law was passed. And there’s very little chance the individual mandate’s approval numbers will improve, now that millions of Americans are getting a taste of what it really means. They’re learning an essential truth of Obamacare, which is that if you don’t sign up, the IRS will make you pay. It’s not going to work for them in 2016, either. PS: Oh, and since we’re talking about angry mobs, let us not forget the IRS sending the wrong tax information to nearly 1,000,000 people receiving Obamacare subsidies.